As every year comes to a close, it’s good to reflect on the year ahead. So every year I tackle a list of what I would like to see in #smsports in the New Year. This isn’t meant to be a list of bold predictions and forecasts. Instead, it’s meant to take the trends and lessons learned from this year and think about how we can apply them in the future. Everyone’s goals and objectives are different, but hopefully there is something here that will align with what you want to accomplish. Below are ten things to consider in social media + sports in 2017. Working in sports can be cyclical. While the game outcomes are unpredictable, there is a level of certainty about schedules, key dates and what is required to do the job (once you’ve been in the industry of course). There are certain things we simply expect to execute, like score graphics and game recaps and sometimes we get caught in the motion of doing to do. Social media is anything but cyclical though. In fact, the industry changes daily. There is a huge opportunity in that. In 2017 get comfortable stepping outside of what you’ve always done. Have you always reported on the score, whether you’ve won or lost? Maybe this is the year you focus less on reporting no matter. Have you focused on photos over video? Maybe this is the year you invest more heavily in video and don’t worry about capturing every single thing. Have you always worked with internal partners for content creation? Maybe this year you enlist outside content creators. Don’t be afraid to mix things up and try something new. If you don’t try new things in social and push the boundaries, then it’s hard to step up your game. You’re the pioneer, the renegade. Put together a thoughtful POV that pushes the envelope. Take a deep breath, write the rules and own 2017 a bit differently. We don’t have to do things the way they’ve always been done. The social share has evolved and changed. A share use to mean a mass message to someone’s entire network, but with the rise of one-to-one communication, sharing has gotten more personal. Nearly 70 percent of online shares are going on within dark social (RadiumOne). That means shares are harder to track and we have to give more attention to messenger apps. As the use of messaging apps and direct messages continue to rise, it’s important to understand how dark social might fit within your strategy and big picture. How can you activate messaging apps and bots from a brand perspective? What can you do to encourage sharing across dark social? How can you ignite niche community and power influencers to spread the word? These are important questions you’ll want to tackle as we head into 2017. 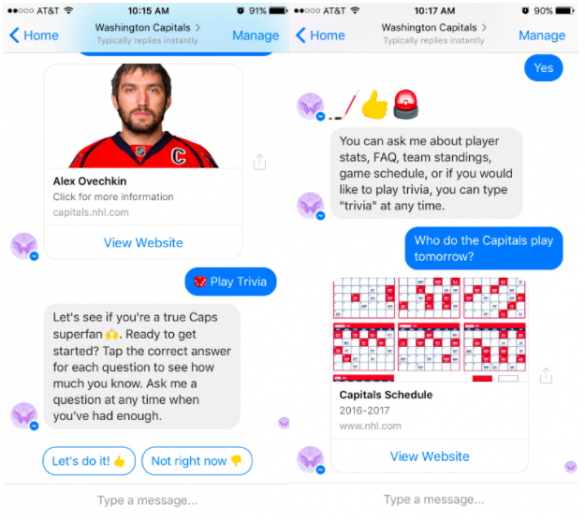 Want an example of a team using messenger apps? Check out what the Washington Caps did here. 3- Maturity/standardization of social roles. In order for social/digital to mature and evolve, there needs to be a standardization of roles within the industry. As someone who has spent their career in social and digital, I’ve seen how hard and confusing it can be when applying for roles in this industry. Companies often don’t know exactly what they are hiring for and/or have a structure in place that actually promotes growth. Because jobs end up being either extremely entry level or more at the VP level, it makes is hard to move up within this industry when you get to the middle manager point in your career. Structure and a vision is sorely needed when building a team. It’s time to take a step back and define roles and teams, actually thinking about what it means to be a community manager versus a strategist versus a director. Every year the demands on this industry grow, but often the team sizes and roles do not. It’s time to correct the wild, wild west of social roles and get to a point where the industry is speaking the same language and there is opportunity for growth. 4- Smart approach to live. It was the year of live video, and there’s no doubt that trend will continue into 2017. But often the problem with new platform tools is that we get in the habit of using them just to use them. It’s easy to hit the button and go live from the field, showing players running on and off over and over again. But that gets redundant. And it gets boring. In 2017, take what you learned from the rise in live video and think a bit differently about your approach to it. You don’t have to go live from the field every day. Resist the urge to go live for the sake of doing so and take a more conscious approach to the content you produce with these new tools. 5- Think like a programmer. With new and emerging platforms like Snapchat, it can be hard to understand how they fit into your content and strategy. The way consumers use a platform like Snapchat is a different beast than some of the more traditional media sharing apps. Platforms like Snapchat have become about human connection, a raw and vulnerable look and entertainment. Social is becoming the new way people consume entertainment. So the challenge in 2017 is to think more like a programmer. With the rise of platforms like Snapchat and live streaming, you can’t just hit the content capture button randomly and find success. Take a page out of TV and think about consistent programming. Consistent programming does not mean that you activate on the platform every day. It means that you establish a consistent approach to content that fans can expect to see certain days of the week. For example, on Friday you might want to start a SportsCenter-like program that previews the upcoming weekend game. This program should be catchy, entertaining and be fueled by personalities and hosts. Take a step back and think about what interesting perspective and value you can provide to fans outside of players running onto the field. Enlist host and personalities who can bring to life the programming and that can entertain your fans. Cross-promote these programs on other platforms. Be creative, consistent and have some fun. 6- Enlist influencers + content creators. In 2017, understand that you don’t have to build community and create content on your own. Take the time to foster relationships with notable alumni and influencers. And second, take the time to enlist content creators that can help tell your story in an interesting way. When it comes to influencers, look inside your circle to identify people who can help build community, build your brand and spread the word. Whether it’s a celebrity fan, influencer or others in your athletic department, don’t be afraid to give influencers within your circle content/tool kits/resources to help spread the word. Florida does a great job of leveraging Coach McElwain to help spread excitement around gameday, but in addition to staff, there’s an opportunity to cast a wider net. When it comes to content creators, there is also a huge opportunity. Social media exposes us to creativity all around the world. Whether it’s a well-known artist or someone who has a hidden talent waiting to be unleashed, there is creative content turned out all day across the internet. Thanks to access to creatives across the globe, there has been a rise to social media influencers known for their unique voice and ability to create engaging content in the space. One thing that is constantly a struggle for most who work in sports is the lack of resources. The majority of social/digital teams are small and nimble, so it’s often hard to focus on every platform and create content specific to it. But with this access to all kinds of creatives, the beauty is you don’t have to tell your story alone. If you keep your eyes and ears out for content creators, you’re sure to find people who can help create content for your team that is unique, engaging and on brand. The Vikings Instagram Group is in Jacksonville this week with guest photographer @bearded_flash_photography. 7- Put on your brand hat. When you work in social media and sports, it’s easy to get caught up in the fast-paced nature of the work and the mentality that you have to go, go, go. As the internet becomes more and more cluttered though, it’s extremely important that those in social media take a step back and put their brand hat on. Working in social media is about telling your brand story daily and connecting with consumers. And even in sports, this storytelling should go way beyond the scores. In 2017, take the time to define your POV, your why and your unique value proposition. Lay a strategic framework that shapes all the content you create. Unique value trumps the “everything”. And when you’ve defined your lane it pushes good, tough creative thinking (including with real-time moments). Take a step back and understand your why. Don’t let this pressure to constantly jump in take you away from the foundation of your work. Your brand’s story is better than any flavor of the day… always. 8- Let ephemeral + evergreen compliment. Ephemeral content is all the rage these days with Snapchat-inspired offerings like Instagram Stories. Now there’s a need to consider how ephemeral content and evergreen content can work together and complement each other. Teams and leagues have done a good job of creating content specifically for Stories. As we move into 2017, think about synergies between your in-feed posts and Instagram Stories. How can you leverage the tool to drive deeper storytelling in a moment? The two should work together. For example, at the end of the game you have your final score graphic and leverage Stories to showcase highlights. Use in-feed post to drive people to Stories (or vice versa) and let the two work together and drive more consumption of your content. As platforms expand their tools and products, it’s extremely important we take a holistic look at all our content and make sure everything is working and driving together to tell a seamless story. 9- Invest in video beyond the hype. Every year video makes this list. And every year the importance of video rises. 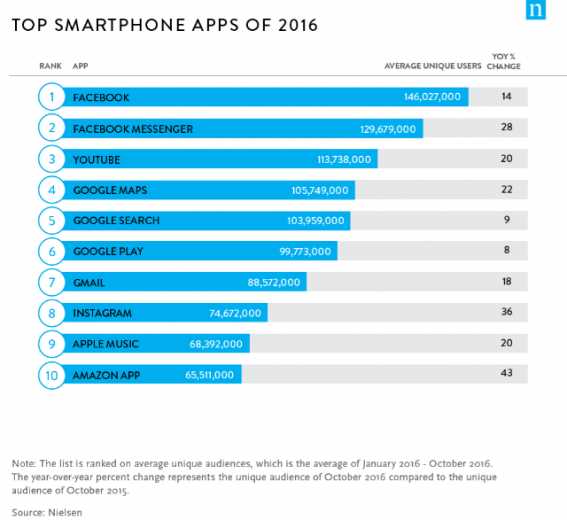 YouTube was one of the top apps of 2016 (according to Nielsen). Video was prioritized by platforms. Consumers consumed a lot of video content. There is so much opportunity for compelling video content in sports. From the access to players and personalities to the traditions, teams and leagues need to capitalize on the opportunity they have to create stellar video content. Find a way to leverage the power of video to tell your brand story, way beyond the scores. Emotion is one of the most powerful marketing tools, and there is so much emotion in sports. 10- Continuation of dynamic, moving image. This year teams and leagues upped their GIF game. And as attention spans continue to grow shorter, the need to create interesting, dynamic content will only increase. In 2017, keep the focus on quality content that is thumb-stopping. At the end of the day, we are all competing for attention. John Wall (25p) has scored our last 12. With all the hype around Snapchat Spectacles, this might be the year point-of-view marketing reigns. It’s raw, unique and gives fans access. Yes, we’ve had GoPros and other tools that have allowed us to capture a unique perspective, but I think we’ll see Spectacles adopted more in mass by teams and leagues. As with all of POV tools though, access + good content creators are key. What would you like to see in social media in sports in 2017? Share below! Great stuff Jessica, as usual. Finding your UVP and sticking with it. It helps define the brand and keeps content focused. POV VR in our future? Hope you spent some time in GA for the holidays.